Tamsin and her partner Rob live in a rural valley about twenty minutes from Tuatapere. Their house is heated by a woodburning stove and they collect rainwater from the roof. 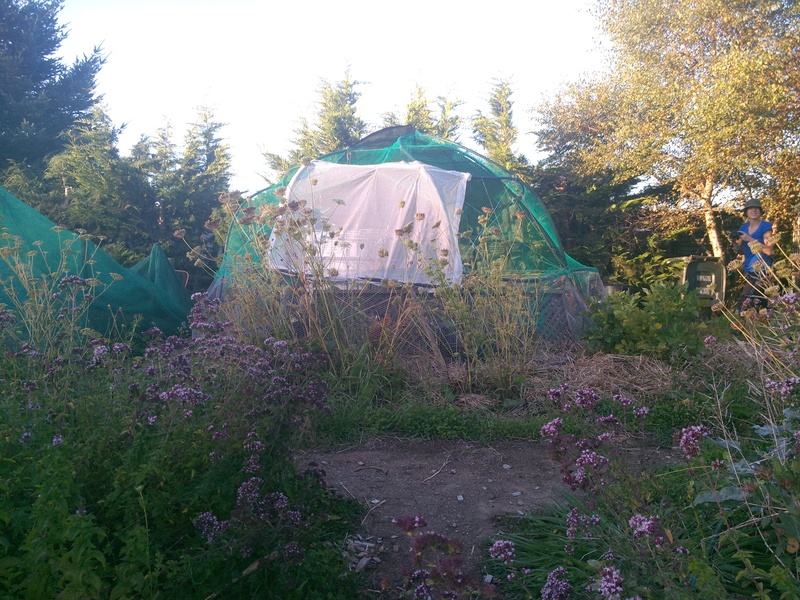 Rob is a deer hunter and Tamsin has been creating a permaculture garden complete with chickens over the last three years–together they produce a substantial portion of their own food and create only one garbage bage of waste every month. 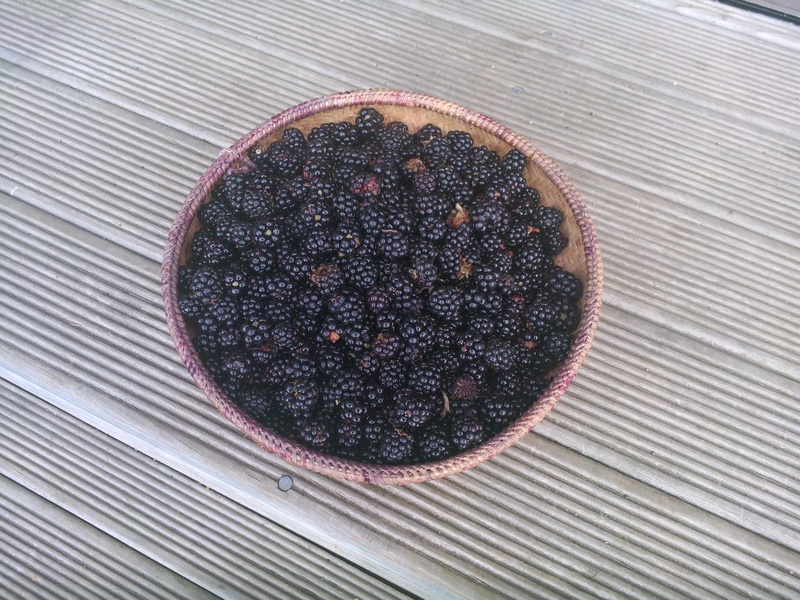 The day I arrived Tamsin took me up behind their house to go blackberry picking. There were tons of them and they were the best I’ve ever tasted! Later we supped on rice and veggies from the garden. The food I ate there was amazing. After a long day’s work in the field, nothing tasted better than fresh, home cooked food. Fresh veggies, homemade kimchi and saurkraut, eggs from the chickens, meat from local farms…I’m still craving the roast venison we had with carmelized onions, mushrooms, and mashed potatoes! In all honesty though, having fresh locally sourced meals, eaten with appreciation, makes a huge difference in how the food feels and tastes. Aside from the daily chores in the garden, Tamsin let me guide the kind of projects we would be doing while I was there. I decided to help her build a chook dome, which she had been wanting to do for some time. 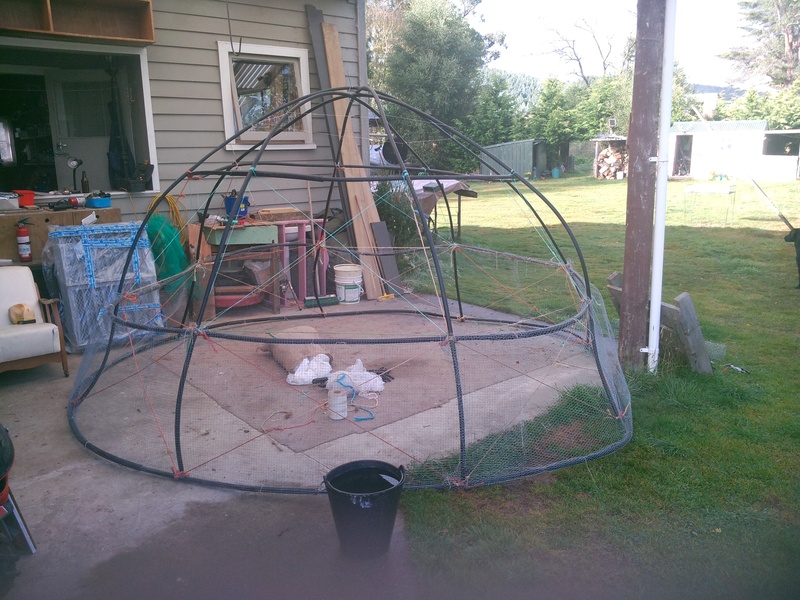 A chook dome is a portable chicken coop made out of netting and pvc piping that you can rotate around the garden. The idea is to contain your chickens in the parts of the garden you have already harvested so that they can scratch up the ground and fertilize the soil without ruining your crops. The task took us about five days, binding together pvc piping into circular struts and archways using baling twine as bracing. The dome started out looking a little wobbly but soon came together, and despite being a bit warped was quite strong. We topped it off with a bambo roost which hung from the ceiling and an egg laying box. The other project I helped tamsin with was “Lasagna Gerdening,” a soil layering technique which maximizes fertility and minimizes labor. The bed begins with a layer of wet newspaper to smother any existing weeds, followed by layers of straw, manure, compost, grass clipping, more straw, and some bone dust. We went to the neigbors to collect a load of horse manure and the local dump, which conveniently had mounds of composting green waste for the taking. The straw Tamsin got from a local farmer in exchange for a treatment in Bowen therapy. Bowen therapy is a kind of bodywork native to Australia which Tamsin has trained in. One day we exchanged treatments, and I got to recieve Bowen, which somewhat resembles a massage. I was really surprised though at how gentle the motions were. They consisted of the slightest bit of pressure applied to the body in strategic ways, followed by one or two minutes of rest in between moves. The movements were really palpable and I could feel my channels opening. It was if the slight pressure was just giving my body the “information” it needed to let go. She followed that up by ringing tuning forks above my body and then used a machine to emit polarized light. Both of these technques were surprisingly strong. I had chosen to WOOF at Tamsin’s because I had a feeling we could learn from each other, and I was right! A few tims during my stay we had some of Tamsin’s magic chocolate and talked about all our ideas of the universe, the body, and healing. Tamsin had had her own battle for health, for years suffering from chronic fatigue and extreme food sensitivity. She has healed mostly through cleansing and nutrition, and views the landscape of nature as analagous to the landscape of the body. Disease results from mistreatment of the land through poor nutrition and trying to dominate it with chemicals, rather than working with the intelligence of nature. This can be seen both in modern conceptions of medicine as well as in environmental issues (there is a big one in New Zealand centered on the use of chemical sprays to kill pests in the forests). At other times we would experiment with different ways to move the body, and spent a while practicing how to engage the limbs in all different positions. One time, trying to strengthen my wrists and hands, I found myself spontaneously making strange hand postures, which I soon realized were different martial arts fists! (You’d be proud, Pashtoun!) 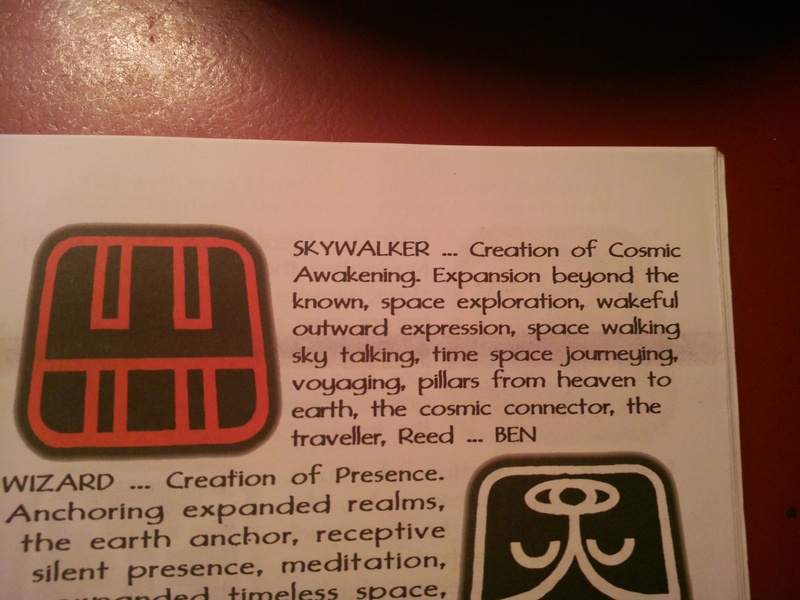 Once we looked up my birthday in the Mayan Calendar and found that the name of my sign in Mayan is “BEN.” We tried to write down everything. The last two days with Tamsin we spent in Riverton, on the southern coast. 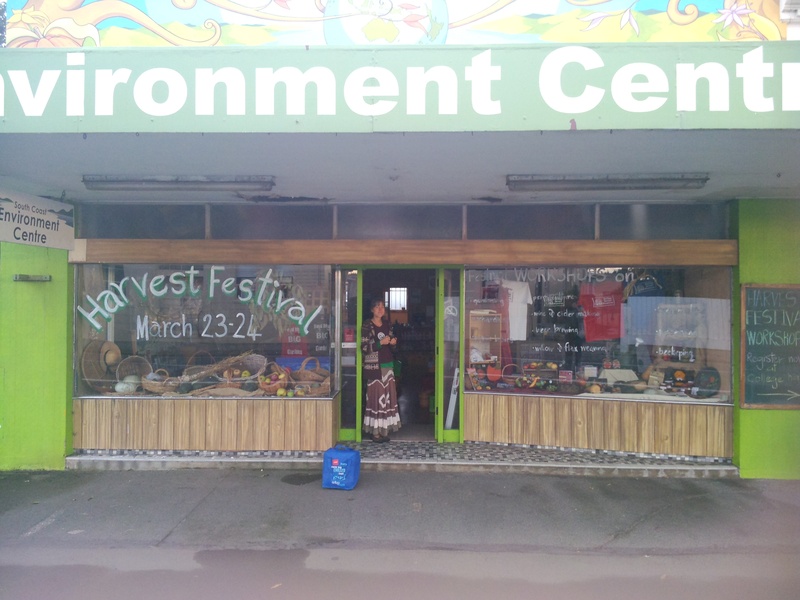 Tamsin works there at the Environment Store, which was having their anual harvest festival. I helped set up and run the festival, which was created by a local couple Robert and Robyn Guyton. Over the last twenty five years the Guytons have created an organic community in Riverton, despite strange looks from the locals. The center of this community is the Environment Store and the Guyton’s own food forest– a two acre plot of land created with permaculture principles which creates a plethora of food and sustains itself virtually without human help. Here the Guytons have been stockpiling heirloom seeds to revive the diversity of food that our ancestors had. They call themeselves “custodians,” protecting the land from monocropping giants like Monsanto. It was an incredibly inspiring two weeks with Tamsin and Rob. After the festival, Tamsin sent me on my way with a packed lunch, a big jar of saurkraut, and some magic chocolate of my own. I was on the road again. Inspiring story! Farming seems like some of the hardest and most rewarding work one could possibly do. It sounds like the food experience you had there couldn’t have been any more natural. It must have been so healing. It’s great that you and Tasmin got to share so much with each other. I’m curious about her ‘magic chocolate’… What’s the magic ingredient!? It’s great that your hands instinctively knew how to build strength through the martial training you’ve done. It means that it’s getting integrated into your body. It often surprises me to be reminded how many people don’t know how to make a proper fist, especially when it’s needed… I take it for granted. The magic ingredient? I’m sure you can figure that out! The fist thing was quite cool. I was doing the various claws/pinches you taught me, as well as beaks and tiger claws and panther fists! Each of them seemed to develop different meridians. I even did them with my feet, as much as that was possible. Thank you for helping me learn the importance of strength my friend!